My computer crashed this week, and I am feeling discombobulated and unhappy with modern technology. But the hardships that accompany our dependence on electronic devices don’t seem so bad when I reflect on the alternative. 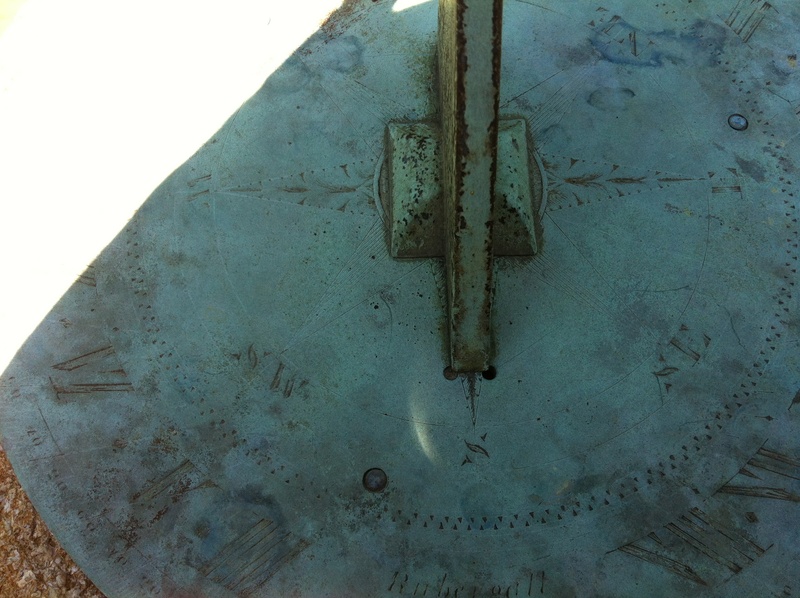 I would much rather use a watch than its historical counterpart, the sundial. The one pictured below is at Whitehall, the 18th century home of colonial Governor of Maryland Horatio Sharpe. It’s beautiful, but I had no idea how to tell what time it was! It is pretty obvious, winter is over – not that we had much of a winter to begin with. The hot days of summer are beginning to make their presence known. While these hot, humid summer days seem unbearable, we are lucky to be living in the 21st century. We can turn on the air conditioning or turn up the ceiling fan, but our ancestors were not so lucky. Lacking these modern conveniences, colonial Americans came up with creative methods to beat the heat. The most obvious ways people in the 18th century dealt with high temperatures are seen in the structures they built. In raising the main floor, adding high ceilings, and building walls with large openings that contained shutters, they maximized the benefits of cross ventilation (air passing through one side of the house and leaving on the opposite side). Cross ventilation provided breezes to combat hot stagnant air. Also, porches provided a nice place to sit and relax while taking advantage of natural air flow. Chimneys were built on exterior walls to minimize the transmission of heat to the interior. Kitchens were often separated from the main house, either attached by a hyphen (as at the Hammond-Harwood House) or in a completely separate outbuilding. Colonial Americans who could afford to construct brick dwellings benefited from that material’s natural properties; the high thermal inertia of bricks means that they absorb heat slowly and emit it slowly. The slow absorption of the heat meant that the interior temperature was lower throughout the day, but as the sun went down and the temperature dropped the absorbed heat was released. At Gunston Hall, George Mason’s home in Virginia, the plan of the house and a photograph of the first floor demonstrate that doors and windows were placed across from each other to maximize air flow. Colonial Americans also wore different clothing during the summer in an effort to keep cool. Men often wore unlined coats or thin waistcoats of cotton or linen fabrics. The thinner and lighter the fabric, the better. Reducing the number of layers worn was another method used to combat the heat; women would lessen the number of their petticoats. Wealthy people could even afford to build a bath house. Lord Dunmore, a colonial governor of Virginia, would retreat to his bath house in the summer, sit naked, and have servants pour cool water over him. These are only a few examples of how 18th-century Americans kept cool during the summer months. If you know of any others, please feel free to enlighten us. This Tuesday was May 1, which for thousands of years has been celebrated as May Day. Originating as the pagan festival celebrating the first spring planting, May Day was first celebrated by the ancient Celts and Saxons. They referred to the holiday as Beltane, the day of fire. Festivities began on the eve of May, April 30, and consisted of games and feasts celebrating the end of winter and the return of the sun and the fertility of the soil. The arrival of Christianity within Western Europe resulted in the Catholic Church outlawing May Day celebrations, but a more secular version of the holiday continues to be observed in Europe and America. In this form, May Day is best known for the traditions of the maypole dance and the crowning of the Queen of the May. The maypole dance is a form of folk dance in which young men and women dance while holding onto ribbons until they became entwined, which was supposed to represent your true love or future spouse. The tradition of the May Queen is said to be based on the Roman goddess Diana, the huntress and goddess of beauty. The May Queen was usually chosen from the local young, unmarried women and crowned with greenery. Many traditions also include a Green Man, May King, or Lord of May to accompany the May Queen. In more modern celebrations, the May Queen wears a white dress, which symbolizes purity, and leads the May Day parade. Unique to the United States is the tradition of the May basket. Typically, these are small baskets filled with flowers or treats and left at someone’s doorstep. The giver of the basket knocks on the door and runs away. The receiver attempts to catch the fleeing giver and if they are successful a kiss is exchanged. Today, the tradition has been modified and simply includes the leaving of a flower-filled basket on a doorstep. Here at the Hammond-Harwood House, our lovely Board of Trustees member and docent Ann Marie Fox left a beautiful May basket on our front porch. She won a gold ribbon for her stellar work!